Simmons Feed Ingredients (SFI) is a family-owned and operated company that produces high-quality animal nutrition for pet food, aquaculture and livestock. In the 67 years since the construction of its first ingredient facility, SFI has continued to acquire additional operations and currently operates plants from Southwest City, Missouri, to Quakertown, Pennsylvania. Simmons implemented its first lubrication program at its Southwest City plant in 2013. The primary lube program consisted of one type of gear oil, hydraulic oil and grease. After several years, SFI switched to blender oil in hopes of reducing cost as well as increasing efficiency. The blender oil, however, resulted in gear and bearing failures. In response to the gear and bearing failures, SFI’s management hired an outside consultant who determined the leading cause of failure to be lax lubrication standards and a lack of appropriate oils. 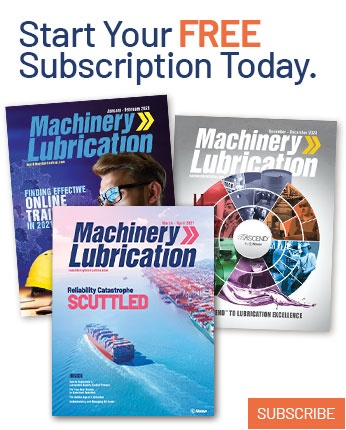 As a company that prides itself on its commitment to innovation, the team effectuated change through the development of a lubrication training plan. 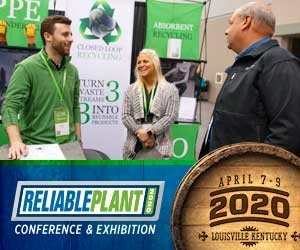 The Simmons team attended the Reliable Plant Conference & Exhibition to view the most efficient tools and resources available in the market, returning from the event with plans for immediate improvements. 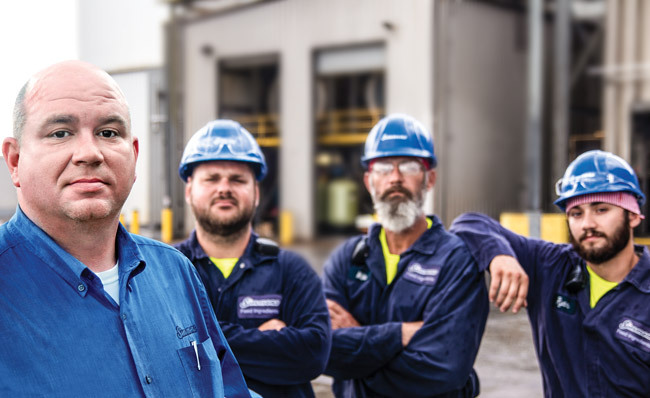 Because of its dedication to lubrication-enabled reliability, the Southwest City plant is now the flagship of reliability and success for Simmons Foods and an exemplar for competing industry manufacturers. As an initial step in program implementation at the plant level, SFI’s management hired an entirely new reliability team. For the program to succeed, the new personnel required commitment to the mission and training in appropriate lubrication habits without needing to break former practices. Over the next two years, SFI’s management sent approximately 30 technicians for various training outside the company, where several employees achieved a Level I Machine Lubrication Technician (MLT I) certification from the International Council for Machinery Lubrication (ICML). Today, all reliability team members must achieve the MLT I certification by the end of their first year and a Level II MLT certification by the end of their second year. High training standards resulted in not only reliable machinery but also in reliable employees. The turnover rate for the maintenance department now sits below 3 percent. The commitment to training, upgrading equipment and consulting outside resources increased the efficiency of the plant and reduced the costs of downtime. The level of asset care at SFI has become the expectation, not the exception, as other Simmons facilities integrate similar practices. was sent back to the supplier and replaced. SFI enlisted outside help to face one of its biggest challenges: determining the correct lubricants and additive packages for each of its machines. However, the Simmons team went beyond a simple upgrade of their lubricants; they began conducting surprise inspections of their lubricant supplier to determine the condition of the lubricants before they reached the plant. These impromptu inspections uncovered several practices that did not meet SFI’s standards. The Simmons team met with the supplier’s management and developed specific procedures for all lubricant deliveries. For instance, each drum must arrive in a factory-​packed container. 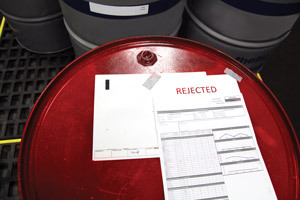 The SFI plant will not accept repacked/co-packed oil drums. If a vendor delivers a repacked drum, employees will not allow it through the door. Technicians now take samples from each new drum and verify the results to ensure they meet SFI’s specifications before introducing the drum into the oil storage system. Noria consultants aided in the establishment of target cleanliness and dryness levels for the plant’s lubricants, enabling SFI to set a standard level of cleanliness through upgraded equipment and consistent testing. Previously, employees dispersed lubricants to the equipment on an as-needed basis. Now, technicians consistently test and clean the lubricants to ensure that they meet the facility’s expectations. Prior to committing to a lubrication-enabled reliability plan, the SFI facility experienced consistent equipment failure. The plant operated in a reactive mode, keeping spare parts in the storeroom to fix machines as necessary. If the facility didn’t have the parts, the machines would be down until the appropriate components arrived. During unscheduled downtime, perishable ingredients had to be sold to competitors at a reduced cost to avoid expiration. By improving its lubrication program and subsequently cutting downtime, SFI is now on the other side of the equation, allowing Simmons to buy perishable goods from its competitors. Today, SFI concentrates on predictive and proactive maintenance rather than on reactive work by focusing on maintenance meetings, oil sampling, vibration analysis and laser alignment. Maintenance practices were designed to pinpoint issues before they occur. Technicians attend basic equipment care (BEC) workshops, and all machinery has a criticality ranking. SFI now performs inspections on intervals and uses condition-based PMs. The company built a world-class oil storage and handling room, added an oil analysis testing program, and dedicated oil filtering systems employed for gear units worth $20,000 or more. SFI’s new standards allow only its trained reliability team to work on oil-related tasks. Simmons also implemented the plant’s oil analysis program in conjunction with its vibration and infrared programs to spot-check equipment and troubleshoot issues that arise. Employees now consistently use ultrasonic grease guns, grease meters and laser alignment. The culture has effectually changed to a total productive maintenance (TPM) philosophy. Newman estimates the cost savings from the avoidance of lost production and gear failures at nearly $1 million per year – just in controlling particle counts. Additionally, the oil program cut breakdowns by more than 50 percent. Simmons considers the lubricant storage and handling facility to be the highlight of its lubrication program. In the early stages of the program, the team recognized this area as an opportunity to significantly improve the facility’s standards of cleanliness and efficiency. The plant has since renovated oil and container storage several times. The final remodel added climate control, insulated walls and upgraded equipment. Originally, employees stored lubricants in the shipping totes in which they arrived and subsequently mounted the materials on racks. Although there were desiccant filters on top of the totes, technicians often removed them for ventilation as they dispensed oil for the machines, using 5-gallon buckets as transfer containers. The plant initially designated a clean room for lubricants with color-coded transfer containers and storage totes. However, the totes used gravity dispensing and lacked pumps or filter systems. The supplier pumped in new oil but only had one pump for all oils. This system forced the plant to flush at least 5 gallons of oil through the pump to prevent cross-contamination. Since the supplier pumped in the oil, SFI had no way to test the oil beforehand, leading to several instances of cross-contamination. In the second redesign, Simmons enlarged the lube room. Color-coded storage tanks were installed with dedicated stationary pumps to eliminate cross-contamination as well as the need to flush oil through the pump. The new system also provided a window to pull and test samples before placing the oil into the storage system. 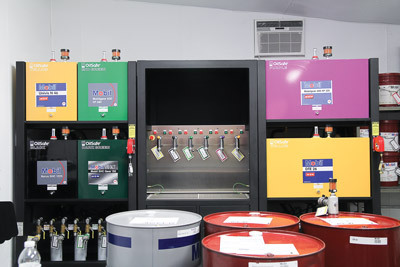 The current climate-controlled lube room contains color-coded bulk storage tanks and dedicated transfer containers/carts to transfer dispensed oil to equipment. A high-temperature steam dishwasher now maintains the quality of the transfer containers. All incoming oils and greases are dated for shelf life. SFI also developed a method for daily cleaning, oil circulating and inspecting safety devices, including static grounds on all transfer pumps. Other features include slip-resistant flooring, an eyewash station and a fire extinguisher. The new storage tanks enable the plant to keep oils cleaner and dryer. With the ability to circulate oil and suspend additives, the tanks maintain the oil in optimal conditions until it is transferred to the equipment. SFI also set a standard for consolidating its lubricant storage to avoid expiration of the lubricants, ensuring a higher quality of materials. The revamped storage areas allow Simmons to cut costs on its lubricants by eliminating excess oil. 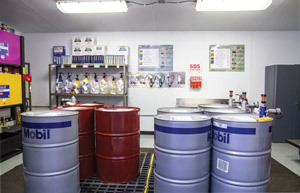 Technicians use sealable and refillable containers that are color-coded and dedicated to a specific oil for low-volume top-ups. 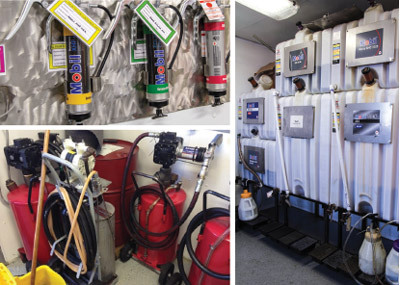 Color-coded filter carts are utilized for the large top-ups and sump oil changes. These carts permit the oil to be filtered a final time as it is put into the machine. Color-coded totes and labels save time as the technicians no longer need to find information on specific machines each time an oil change, top-up or oil analysis sample is required. Each machine has a color-coded identification tag that matches the lubricant label on all storage and transfer devices with the machine number, machine description and lubricant description. All grease points adhere to the same practice. The equipment’s color-coded caps match the grease gun colors as well as the labeling on the grease tubing and can be traced back to where the grease is stored. The SFI lube room is now in a centralized location, accessible from all areas of the plant. Employees no longer travel from one end of the facility to the other for supplies. With a clean, climate-controlled environment that is safe from water and other contaminants, the shelf life of lubricants can be extended. As part of its reorganization, SFI fine-tuned its management, scheduling and documentation to ensure that the team could determine accountability throughout the facility. A reliability team was formed, and technicians were assigned to consistently service their machines with proper lubricant amounts at the correct frequencies. When the new program began, SFI hired Noria consultants to provide procedures for all lube points. These procedures included frequencies, amounts and step-by-step directions for servicing each piece of equipment. For the first time, technicians could refer to a standard document on how to correctly service equipment. Now, whether the technicians are new or experienced, they can service the machine in the same way. In addition to the required training on preventive maintenance optimization (PMO), optimizing the documentation during maintenance rounds has improved the schedule for equipment repair. If technicians identify an issue, the new procedure requires employees to immediately create a work request. This system increases the efficiency of equipment repair and enables management to track and check specific replacement parts. In the initial stages of the new program, the plant relied on its supplier’s laboratory to analyze oil samples before switching to an outside lab. After changing to the new lab, Simmons implemented oil analysis training in order for personnel to set their own alarms and limits for each sample. The company discontinued the lab’s standard one-size-fits-all approach to testing and developed written test slates for each sample from every piece of equipment. This testing procedure provided patterned information, ensuring that each sample revealed as much as possible about the machine’s performance. SFI also set up exception testing in the event that the samples demonstrated deficiencies. Exception testing saved time in reviewing the reports because the lab already had instructions in place to find the necessary information. Today, SFI’s educated team utilizes the optimal practices with top-of-the-line sampling equipment. Two onsite reliability engineers with Level II Machine Lubricant Analyst (MLA) certifications perform all sampling. Updated equipment with sample ports allow technicians to collect samples correctly and efficiently. SFI also added bottom sediment and water (BS&W) bowls and 3D bull’s-eye sight glasses to help monitor the oil. 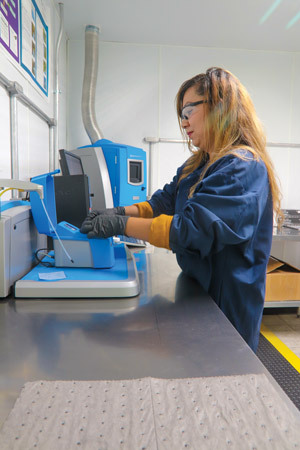 Simmons recently converted a former breakroom into an in-house oil analysis laboratory, outfitted with the appropriate equipment to retrieve the information from oil samples. The lab also provides a faster analysis of incoming and in-service lubricants. SFI improved the sampling of vacuum pumps with cleaner sample bottles and more efficient methods. The facility also upgraded sampling hardware, ensuring the right type of sampling valve for the equipment. Noria developed written procedures that detail the processes of the sampling program, enabling technicians to collect information with a consistent method. As part of the new lubrication program, SFI upgraded its equipment to remove contamination from its machines. Mobile filter carts were purchased to move from machine to machine. Technicians used a dedicated filter cart for critical machines to continuously circulate oil. These dedicated filter carts were put on large sumps, and facility personnel employed portable filter carts for the smaller sumps. The transfer filter carts and top-up containers are color-coded to match the storage tanks and the equipment’s lubricant identification system (LIS) tags. The filter carts allow for the filtration of oil one last time before the machine is filled with new oil. Both the filter carts and the equipment have been retrofitted with quick connects, enabling them to connect to a machine without exposing the oil to the environment. All machines are equipped with desiccant breathers and sight glasses to keep them sealed. Using this practice, Simmons found that oil can last for years beyond the previously perceived life expectancy. Contamination control gives the plant’s machines a longer lifespan, resulting in fewer breakdowns. Some oil has been in the sumps for 1,500 days and is still in good health. In just one year, Simmons saved approximately $43,000 through its contamination control methods. Plant personnel previously used recycled containers to move lubricants from one place to another without a standard cleaning method. Technicians also handled grease guns in an unregulated manner – a key contributor to the recurring breakdowns. To remedy this issue, Simmons purchased color-coded, lubricant-​dedicated equipment so the transfer containers possessed the same product in them at all times, helping to avoid cross-contamination issues. 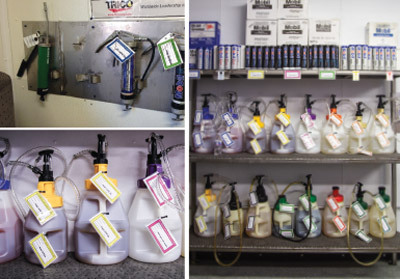 All lubricants are now stored in the lube room in color-coded, designated areas. The color-coded labeling system corresponds to the lubricant’s brand name. Displayed posters allow technicians to know which lubricant they are selecting when they use a transfer container or fill from a bulk system. SFI personnel immediately replace damaged or missing labels. At the end of every shift, technicians clean all transfer equipment before storing it in its designated place. A steam-generated dishwasher cleans and sterilizes dirty and empty equipment, and employees properly dispose of and replace any equipment in poor condition. As they run their routes, technicians are responsible for verifying that the LIS tags installed on the equipment are legible and in the right location. This attention to detail instills a sense of responsibility and pride in the workers, as the technicians confirm that all aspects of their routes are clean and that the tools are maintained. The program significantly benefits from their sense of ownership and accountability. Key performance indicators (KPIs) permit SFI to continuously analyze the critical success of its improved lubrication program. For instance, Simmons began tracking metrics such as the oil cleanliness percentage on target assets and lube consumption vs. waste oil. The facility also monitors unscheduled downtime, maintenance costs, oil spending and oil analysis trends on critical equipment. These tracking methods enable the company to justify expenditures within the lube program. Since the implementation of the new lubrication program, the facility has achieved a 50 percent reduction in downtime – a figure that continues to climb as new standards are integrated into every aspect of production. The facility’s implementation of cautionary and critical alarms on its machines is another key factor in decreased downtime. The alarms allow SFI to plan 85 percent of its work orders because employees can identify necessary replacement parts before the machines fail. As previously stated, employees now complete oil samples and analysis on every gear unit valued at $20,000 or more. The plant no longer fights to keep machines running but instead maintains equipment health through consistent monitoring. The company’s KPIs validate the successes of these new methods. 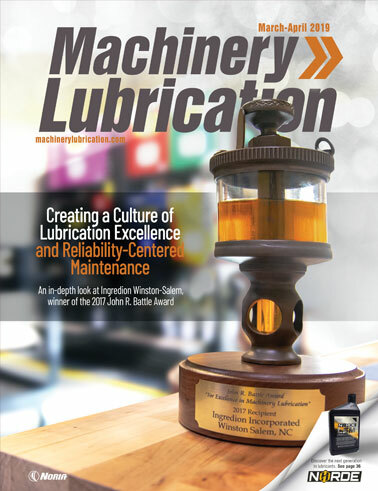 In April 2017, the International Council for Machinery Lubrication selected the Southwest City plant as the winner of the John R. Battle Award for excellence in the application of machinery lubrication. The award honors organizations that demonstrate a world-class lubrication program supported by multidisciplinary approaches, sustainable results and continued improvements. The site reduced downtime by 50 to 60 percent, with almost 75 to 80 percent of jobs now planned. New technology allows the plant to remain in a predictive state rather than a reactive one. The plant uses failure mode and effects analysis (FMEA) and root cause analysis (RCA) to avoid future failures and to ensure that PMs are adequate. Design changes on equipment are improving asset life, while visual controls are leading to proper applications and preventing failures. SFI’s upgraded tools and enhanced training continue to take the program to the next level. When the plant first embarked on its journey in 2014, an outside consultant completed an assessment of the facility’s lubrication program. The plant received a score of 50 out of 100. When the consultant reassessed the facility at the end of 2016, the plant earned a score of 96. SFI’s dedication to its core values of responsibility and taking action has set a new industry standard. Despite the facility’s accomplishments, the Simmons team continues to advance their education and methods in lubrication-based reliability.